One of the things, that people don’t take time to look carefully, is the monuments. Some are very impressive with many sculptures and some are a beautiful statue with many nice details so when you cross one of my favorites, take some minutes. The Doctor Robert monument (plaza tetuan). 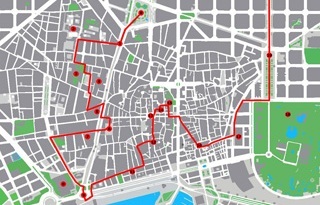 To see it, you will have to go in the middle of the square, this monument is to pay tribute to Bartomeu Robert who was a doctor and the mayor of Barcelona. Built between 1904 and 1910, Domènech i Montaner started it but Josep Llimona finished it and you can spot many sculptures on both sides representing peasants, workers and politics. The Jacint Verdaguer monument (plaza mossen jacint verdaguer). This impressive monument was a project by Josep Maria Pericas i Morros which lasted from 1914 to 1924 to pay tribute to the poet Mossèn Jacint Verdaguer. The statues are a work by Joan Borrell which the top one represents the poet and the ones below the poetry. 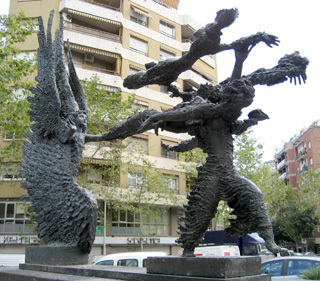 The reliefs, surrounding Jacint, are a work by the brothers Llucià and Miquel Oslé telling different poems of the artist. 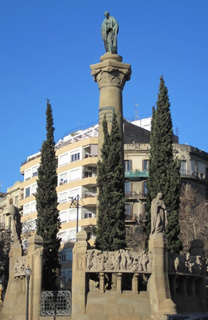 The Rius i Taulet obelisk (passeig lluís companys). Situated in front of the main entrance of the Ciutadella Park, it is to pay tribute to Francesc de Paula Rius i Taulet who was the mayor of the city during the 1888 universal exhibition. 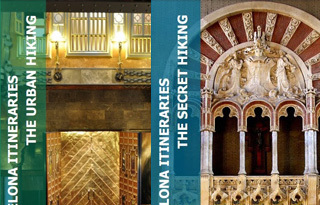 Built between 1897 and 1901, it was a project by Pere Falqués i Urpí and the sculptures are done by Manuel Fuxà. On the side in front of the entrance, you will see the mayor and statues representing the work and the city; on the side in front of the triumph arch, you will discover an angel symbolizing the fame and statues representing the art, the science and the industry. The good weather chasing the storm statue (avinguda gaudi 67). This beautiful bronze statue is a work by Apelles Fenosa dating from 1978 and inaugurated in 1985. The meaning of the work is the fight between the positive, represented by the good weather, and negative values, represented by the storm. 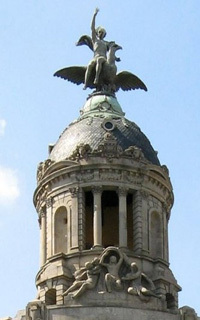 The phoenix statue (passeig de gràcia 21). Each time I walk past near this number, I always raise my head to look to the statue situated at the top of the dome, personally I like the statues done by Frederic Marés. The building is built between 1927 and 1931 and the other sculptures represent the industry, the agriculture, the navigation and the arts. 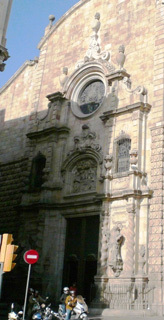 The main façade of the Betlem church (calle carme 2). You can´t stay indifferent once you are in front of the main entrance of the church built between 1680 and 1732, at least for me, I am amazed about the work done by Andreu Sala and Francesc Santacruz. You will see 2 statues representing saint Francis Borgia and saint Ignace de Loyola surrounding by solomonic columns and above the door, it is a representation of the nativity. 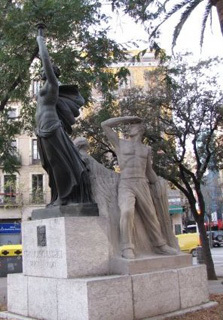 The Francesc Layret monument (plaza goya). It is a work done by Frederic Marès in 1936 in order to pay tribute to the lawyer Francesc Layret killed in 1920 by a thug contracted by the catalan association called Sindicatos Libres. The main statue is representing by a woman brandishing a torch which symbolizes the fight spirit, behind her, there are 3 others, a worker, a farmer and a woman with a child representing the most humble classes. Thank you for your amazingly, well written, insightful, informative page. 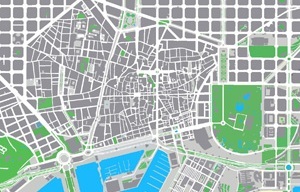 I just spent four days in Barcelona last week and was amazed. 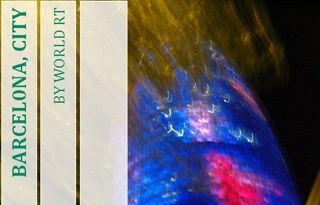 I was looking for the name on a monument and the first link that interested me was yours. I definitely found what I was looking for. The good weather chasing the storm statue was what I had found and was looking for its name. Thank you for helping me!